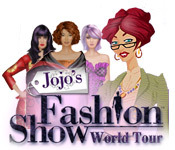 From Japan to Barcelona, racks of vibrant clothes and lifelike male and female models await in Jojo's Fashion Show: World Tour!Travel across the globe with Jojo!From Japan to Barcelona, racks full of vibrant clothes and lifelike models await in Jojo's Fashion Show: World Tour. Mother and daughter designers, Jojo and Rosalind Cruz, have finally earned a name in the fashion world. Now Ros is leaving the nest to pursue her own dreams and Jojo must find a replacement in this fast-paced Time Management game. As backstage drama unravels, Jojo quickly discovers that fair-weather friends and ruthless enemies are closer than she ever suspected!